Mister Miguel wants his tacos and he wants them NOW! “Brutal” and “time management” aren’t usually two concepts I associate with each other, but Mister Miguel’s is easily one of the most punishing time management games I’ve ever encountered. 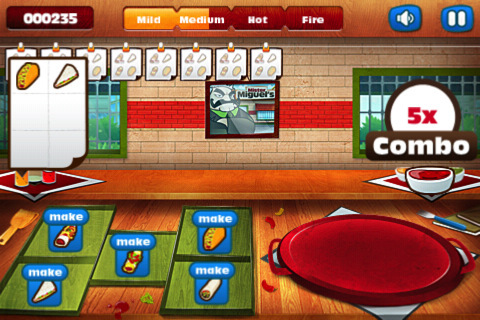 If the real food service industry was anything like this game, all short order cooks would either be homicidal maniacs or broken shells of humanity. We’re probably all familiar with the general time management concept by now, and Mister Miguel’s starts off familiar enough. An order comes in and you have to tap the appropriate dishes to start cooking. Once the food items are ready, you drag them to the tray and send the completed tray out to the diners. Easy, right? Now, ordinarily, a game like this would progress gradually, slowly stepping you up level by level, occasionally letting you purchase upgrades to help you on your heartwarming culinary journey to become the best chef in town, or something like that. In Mister Miguel’s, you’re strictly hired slave labor, and when the lunch rush comes around, you had better be good and ready with those burritos and enchiladas or you can kiss your sorry job goodbye. Seriously, working at Mister Miguel’s is a restaurant nightmare, with a woefully understaffed kitchen (just you), and a boss that radiates pure evil from his mustache and eyebrows. There is only one never-ending level, and you’ll be lucky to last 5 minutes, because after the first few, the orders really start flying hot, heavy, and utterly relentless. Make too many mistakes or take too long to get the food out, and it is game over. I’m not entirely sure what I was expecting from Mister Miguel’s, but it was definitely an eye-opening, if rather grueling, experience. I think the legitimately challenging time management game is an underdeveloped genre, and this was a nice change of pace from the typical casual fluff, but Mister Miguel’s is just too rushed and doesn’t offer quite enough to keep things interesting. Although I liked the concept, with only one level, the action gets repetitive much too quickly, and while the graphics, Game Center achievements, and jaunty soundtrack are good, the constant pestering for an App Store rating was not. Overall, Mister Miguel’s is kind of like a lone taco: even with a little too much hot sauce, it isn’t bad, but there’s just not enough there to make a full meal. 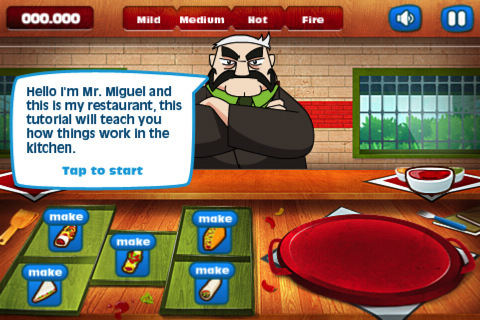 AppSafari review of Mister Miguel’s was written by Tracy Yonemoto on February 3rd, 2011 and categorized under App Store, Games, Time Management. Page viewed 4934 times, 5 so far today. Need help on using these apps? Please read the Help Page. I have to agree with the reviewer, this time management game is fun to play and quite different from other games alike. The graphics are crisp and cartoonish, so in my book thats a big plus! I understand and appreciate the nostalgia trip thingy about old school gaming but most of the time I require modern looking stuff. When it comes to game play Mister Miguel is very challenging! so if you enjoy a good challenge you’ve found a good match. Anyways, Mister Miguel is super entertaining and fun to play, so for $1.99 you cant go wrong.